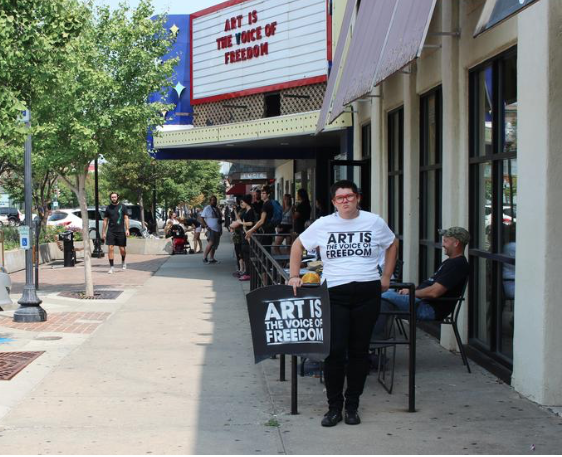 Hundreds in T-shirts reading ‘art is the voice of freedom’ fanned out along either side of Massachusetts Street in Lawrence, Kansas, Saturday in anticipation of a so-called ‘Defend the Flag’ demonstration. Hundreds gathered along Massachusetts Avenue in Lawrence, Kansas, Saturday in anticipation of a so-called ‘Defend the Flag’ demonstration. Both gatherings were partly in response to a recent art installation at the University of Kansas. Clay Mead, owner of Hog Holler Saloon in Ozawkie, Kansas, organized the ‘Defend the Flag’ event, which he told KCUR, was not a demonstration or a protest. “We’re just walking with the flag, that’s it. Showing it honor and respect. It’s not a protest against anybody else,” Mead said. 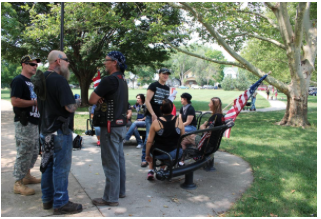 Around a dozen gathered in South Park as part of a so-called ‘Defend the Flag’ event Saturday. The group did not follow through with their original plan to march down Massachusetts Avenue, where hundreds of counter-protesters lined the storefronts from 11th to 7th Street. The piece by New York City-based artist Josephine Meckseper looks like an American flag, altered with stains and adorned with one child’s sock. It’s part of a nationwide public art project exhibiting commissioned flags intended to reflect the current political climate. Dressed in an ‘art is the voice of freedom’ shirt, playwright and community member Darren Canady said the art was definitely a spark for Saturday’s turnout. “Arguably all art is political, but what concerns a lot of people is the silencing of the ability to talk about American identity,” he said. Some of the counter-protesters Saturday. Organizers estimated 600 came out to stand against the anticipated ‘Defend the Flag’ demonstration. Another reason the community turned out in such large numbers, according to counter-protest organizers, was because of a previous demonstration in February, which reportedly got heated after people showed up with Confederate flags, despite instructions from Mead and other ‘Defend the Flag’ organizers not to. “There was a lot of fear,” Canady said. Organizer Courtney Shipley said Lawrence mobilized after February’s event to take a stand against hate groups. This Saturday’s event in Lawrence also came on the anniversary of a decisively confrontational ‘Unite the Right’ rally in Charlottesville, Virginia, attended by white supremacist and white nationalist groups, which turned deadly. “Those rallying and walking into this peaceful community… that you take advantage of people’s pain and you whip up people’s fear on the anniversary of Charlottesville, you are looking for a violent engagement, and we need to be an nonviolent society,” said Eleanor McCormick, associate pastor at Plymouth Congregational Church. Mead told KCUR he knows “nothing” about what happened in Charlottesville last year, only what the media reported. But, he said, he doesn’t associate with white supremacist or nationalist groups. As for the timing, Mead said it never crossed his mind, and that they decided to gather today because of a community safety fair for children happening at the same time in South Park, where dozens of law enforcement and first responders set up at booths. Meanwhile, the hundreds along Massachusetts Avenue assumed Mead’s group would march up and down the street like they did last time, so they waited in silent protest, with instructions to remain peaceful. Both groups expressed that they didn’t want confrontation, and on the whole, the gathering and counter-protest were uneventful. Counter-protester Sam Beeson, 25, from Baldwin, Kansas, said though she wasn’t expecting fights, she definitely thought more would happen. “It feels great that we’re getting together in a nonviolent way,” she said. Amy Baughman came Saturday to show her support for the American flag. Mead’s group remained on the benches in South Park waiting for more people to show up. At one point, an older woman approached and asked Tina Montgomery if her granddaughter could see the flag she was holding, saying she’d never seen one up close. Another member of the group, Amy Baughman, said she stands up for the flag because she feels like it doesn’t get the showing of support she feels it deserves. By mid-day, Mead’s group left, and the hundreds along the street began to disperse, after walking up and down and hugging to celebrate a peaceful demonstration. Andrea Tudhope is a reporter in conjunction with the Kansas News Service. Follow her on Twitter @_tudhope.